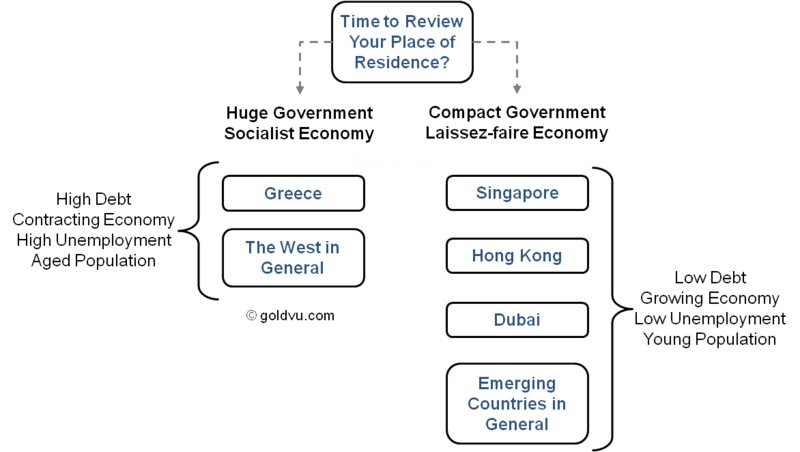 I wish to dial things back in time before tackling the Greek economic crisis and look very briefly at the big picture, pre and post the global 2008 crisis, which was only postponed by action taken by Western Central Banks and governments. All the measures taken to date were of the 'kick the can down the road a bit' variety, rather than action taken to address the core problems and issues. Since April 2009 we have been living in the 'eye' of this epic financial/economic storm. It now looks like we are nearing an inflection point, where we will exit the eye and re-enter the storm, making the Greek economic crisis seem insignificant. Phase 2 of the crisis will be orders of magnitude greater than phase 1 (2008), because the actions taken by various governments and Central Banks have been aimed at buying time, and that has only stoked up the pressure and exacerbated the problems across the board. The Greek economic crisis, in my opinion, is the poster child of what is wrong with the whole Western 'socialist' system. It has been a gradual process, which is typical of democracy, as successive governments promise ever greater benefits to their populace in order to 'buy' votes. In my opinion, we are nearing the end game of this current democratic cycle, which will require some type of social epiphany or social revolution, in order to get back to the basics. Historically, each democratic country is usually dominated by the elites (by birth/wealth/education), and governments tend to favour the wealthy and 'big' business, based upon the perception that these categories were/are the principal job generators. However, in reality, the largest job generators by far, are micro/small/medium sized companies, and for those companies to flourish and grow, an approach is required unlike the socialist one that helped lead to the Greek economic crisis. Indeed, many credit Margaret Thatcher’s reduction of government red tape, along with the introduction of tax incentives for businesses, as being the main reasons that Britain experienced an appreciable increase of economic activity, and a reduction of unemployment in the 1980’s. It is a great pity that lesson is long forgotten, by Britain and most Western nations. In my opinion, pretty much without exception, Western democracies are corrupt; social service budgets are unsustainable; government civil service staffs are bloated, self interested, inefficient and unsustainably costly; pension funds are largely a myth and pension payments are predominately funded from current tax revenue. The Euro was a flawed currency from its inception, as it did not incorporate a 'union of debt'. Apparently the political thinking at the time was that a common currency was the easiest way to start the process of bringing the European countries closer together. A common language, or common legal system were out of the question at that time, but a common currency seemed a logical first step. If, at a later date, a Eurozone country’s economy diverged from the rest, that would present a suitable opportunity to address the thorny issue of the union of debt. What the politicians did not anticipate was that several countries would experience severe economic difficulties simultaneously! Had the union of debt been in place, would the Greek economic crisis exist? Initially, the Euro was a boon for the Eurozone countries. The stronger Eurozone economies found that the Euro made their exports to weaker Eurozone economies far more competitive than hitherto, as their currencies were now of equal value. Equally, the weaker Eurozone economies found it easier to afford previously expensive goods from the likes of Germany as their currencies were now of equal value coupled with the added incentive of financial loans for the purchase of those goods were made readily available by the exporting countries. It appeared a win-win situation, but all it did was build towards the situation that we now we face today, with the Greek economic crisis and the remaining PIIGS in dire financial difficulties, and the Eurozone with a two speed economy. My perception is that Syriza came to power because the Greek populace had lost all faith in the principal political parties, and the elites that dominated those parties. However, Tsipras and Varoufakis et al were handed a poisoned chalice; probably to the great relief of the principal Greek political parties, who were well aware that the Greek economic crisis and general financial state of the nation had long passed the point of no return. Syriza was pegged to be the fall guy for when things all fell apart, which would then present the elites with the opportunity to once more take political centre stage as the country's saviours. I completely agree with Varoufakis when he called the financial support package provided by the Troika in 2010 "a cynical transfer of private losses from the banks' books onto the shoulders of Greece's most vulnerable citizens". "A small fraction of the €240bn of loans remained in the Greek economy. Some 90pc was rotated back to banks and financial creditors. The damage was compounded by austerity overkill. The economy contracted so violently that the debt-ratio rocketed up instead of coming down, defeating the purpose. The Greeks know this. They have been living it for five years, victims of the worst slump endured by any industrial state in 80 years, and worse than European states in the Great Depression. The EMU creditors have yet to acknowledge in any way that Greece was sacrificed to save monetary union in the white heat of the crisis, and therefore that it merits a special duty of care. Once you start to see events through Greek eyes - rather than through the eyes of the north European media and the Brussels press corps - the drama takes on a different character". In essence, by agreeing to that rescue package it only served to compound the Greek economic crisis. The Troika, the EU and Greek leaders, as well as the main stream media, all hailed the financial rescue package agreed to in 2010 as being a big step forward in bringing Greece's finances under control. In reality, that rescue package did not rescue Greece per se; it rescued the banks that were facing enormous losses in the event of a Greek default. This is one of those 'let's kick the can down the road' actions in order to buy time. Even before they came to power, the mainstream media was working hard to create the impression that if Syriza was elected to power, it would be the financial and economic kiss of death for Greece with no hope of resolving the Greek economic crisis. In my opinion the €240bn financial rescue package arranged in 2010 set the stage for a major financial day of reckoning in Greece, it was only a question of time, and that day of reckoning has arrived. Syriza had more than just a poisoned chalice to cope with, insofar as its mandate from the electorate effectively called for Greece to remain in the euro, whilst seeking an appreciable easing of the austerity measures. The reality of the matter is that the Greek sovereign debt levels are simply far too large for the country to service. 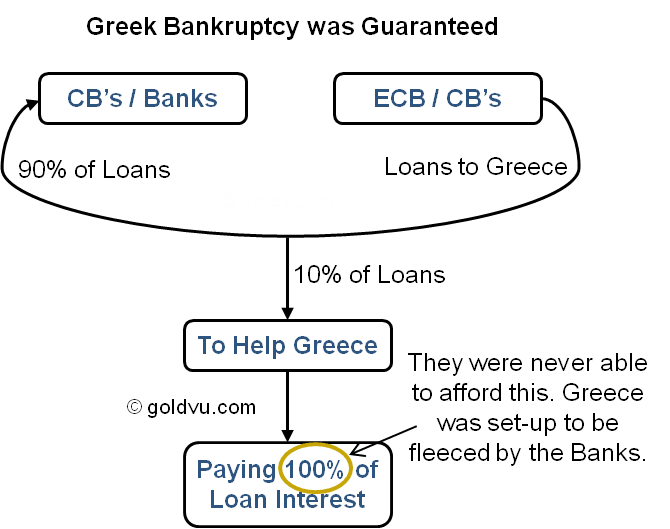 If Greece is to have any realistic chance of meeting its interest and principal loan repayment obligations, the overall debt levels would have to be written down (reduced) substantially, which would involve holders of that debt to suffering losses, which include the ECB, IMF, several international banks and governments. The only way Syriza had any chance of fulfilling its election mandate, was to push the EU hard, right from the beginning. He would have to point out the obvious and conveniently ignored fact, that Greece is in effect a bankrupt state! Tsipras (prime minister) and Varoufakis (finance minister) made it abundantly clear to the EU, that under the Greek economic crisis, Greece was simply incapable of meeting its current loan and interest repayment commitments. They demanded that an agreement should be reached to make a substantial write down (reduction) of the amount of outstanding Greek debt, so as to reduce it to a genuinely sustainable level. Under the circumstances what else could Tsipras and Varoufakis do? The aggressive stance adopted by both Tsipras and Varoufakis on the Greek economic crisis, appeared to have taken the EU leaders completely by surprise. The EU leaders realised that if they agreed to Syriza's request to undertake a substantial write down of Greek sovereign debt, that similar requests would be quickly forthcoming from other Eurozone countries in difficulties. As far as the EU leaders were concerned, the only way to deal with the Greek request was to stonewall Syriza and buy time, knowing full well that Greece was rapidly running out of money which, out of necessity, would force Syriza to accept the EU and the Troika's terms.